IT Service Management (ITSM) platforms drive increasing value over time by identifying, tracking, and reporting IT incidents. However, incident resolution needs are not fully addressed by an ITSM. Optimizing incident management is an important step to explore as validating, diagnosing, and resolving incidents today are often manual, time consuming, and can have dire consequences. 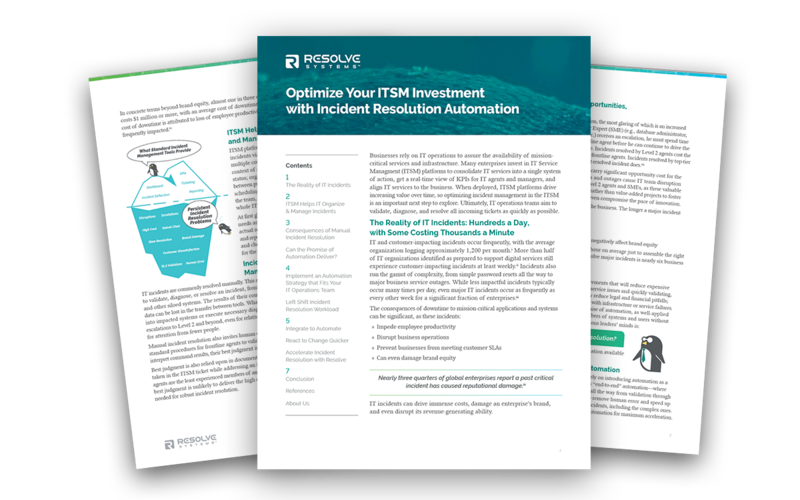 Download the White Paper now to see how an integrated experience helps optimize your ITSM investment. Your whitepaper is ready to download. Discover the ONLY IT Automation Platform You’ll Ever Need. © Resolve Systems. All rights reserved worldwide.